Troll metallers Aktarum from Belgium have recently released their second EP with the catchy title “Game of Trolls“. The band was formed in 2005 by TrollAklass (guitars) and Trollour (synths, vocals), mixing epic folk metal with black metal elements and troll thematology. In 2007 they released their first demo and one year later their first EP “We Are the Trolls” was out. 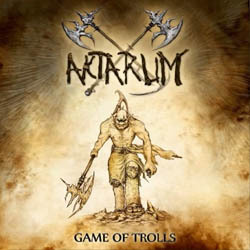 Their debut full-length album “Gang of Trolls” was self-released in 2010 and after four years and several line-up changes, Aktarum return with their new EP “Game of Trolls“, released on May of 2014. The band continues on the style of its debut album, but everything is much better now, both in terms of sound quality and songwriting. Except for two short instrumental tracks (intro and outro) the EP contains 4 songs and its total duration clocks at 24 minutes. Aktarum play a kind of epic blackened metal with a lot of synths, adding an almost symphonic touch in their orchestrations and at times a folkish mood in their music. The 4 main compositions are very catchy, with many beautiful epic melodic tunes that can easily stick in your head. Guitar riffs have a more rhythmic role in their music and the band leaves most of the lead melodic lines to the keyboards. Trollour’s black metal screaming vocals is actually the most extreme element of their music, while he also uses few clean male vocals and some spoken parts. Luckily enough they have done a very good work in the compositions and the final mix sounds quite interesting, even if I would prefer it a little heavier. And while the whole “troll thematology” has usually a lighter humorous mood, in Aktarum’s case their lyrics focus on the epic side of the concept, all sang in English. “Game of Trolls” is a very enjoyable and easy to listen EP, leaving many promises for Aktarum’s future. Their production is improved for sure and their synths may be really catchy, but the band still needs a lot of work if they want a more solid and natural sound. My favorite song is “Light up the Torches” and I hope the band can keep the same composing level for its upcoming full-length. “Game of Trolls” is self-released in a standard jewel-case CD with 4-page booklet illustrated by zero-scarecrow13. You can visit their official pages for more details and sound samples.